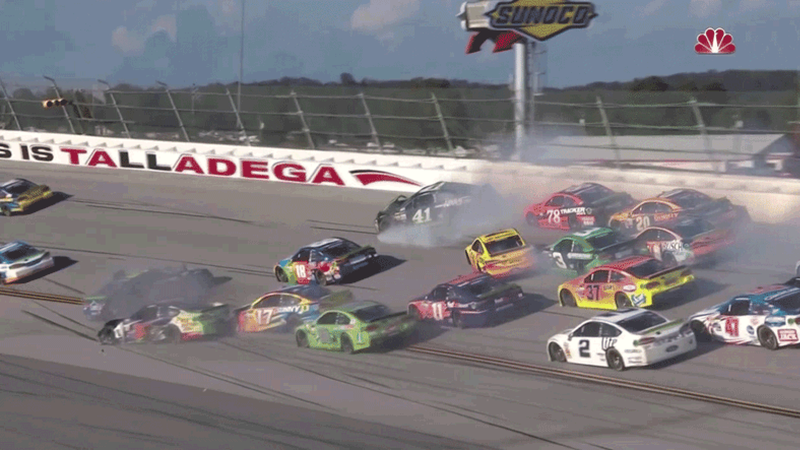 Today’s Monster Energy NASCAR Cup Series race at Talladega gave everybody what we all expected: the big one. A 17-car crash piled up behind the top few leaders on lap 172 of 188, red flagging the race for a massive cleanup. Martin Truex Jr.’s No. 78 tried to make it four-wide unsuccessfully, setting off a massive chain reaction that involved 17 race cars, including six current playoff contenders: Jimmie Johnson, Martin Truex Jr., Kyle Busch, Matt Kenseth, Kevin Harvick and Ricky Stenhouse Jr.
Johnson was forced to retire his heavily damaged car after his crew touched it during the red flag, but I’m not sure it was in a condition to be repaired anyway. I tried to get in a hole that was closing up at the wrong time. I got into the 38 in the right rear and it all got squirelly. We had nothing to lose today, but at the same time you don’t want to be the person that causes others problems. I’ve never been that guy here before, but today it looks like it was. I just wish I didn’t make that mistake. Bad judgment. I should have been more patient. 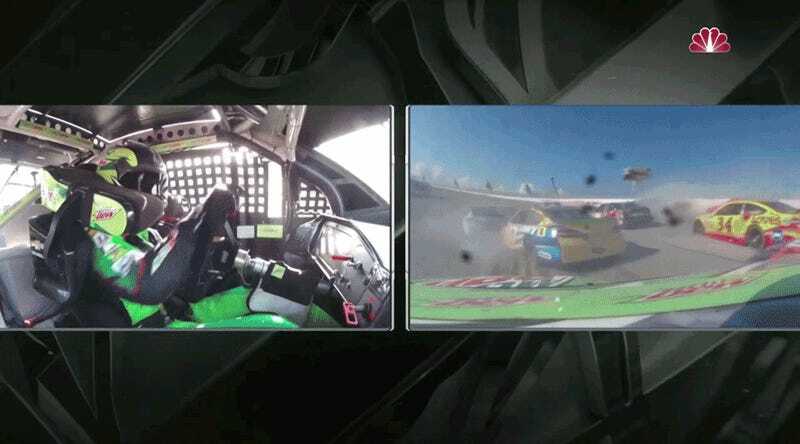 Most incredibly, fan favorite Dale Earnhardt Jr. managed to avoid the wreck with helpful guidance from his spotter. Earnhardt dove down under the big crash, off-roading sideways at one point but managed to save it. He’s still in it! Brad Keselowski also successfully navigated the front of the big crash, although not as dramatically as Dale’s dirt drift. The race had to be red flagged for the gargantuan cleanup needed to get the track ready to race again. 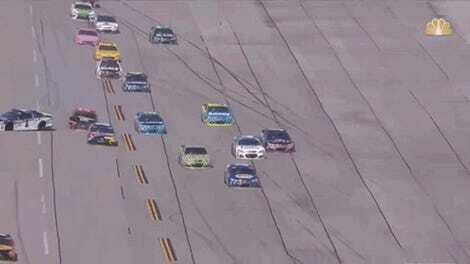 Only 19 cars remained on the lead lap on the restart. A smaller crash happened right afterwards with 11 laps left with yet another close call for Dale Jr, bringing out another red flag. Cautions beget cautions beget more cautions, as they tend to do at ‘Dega. 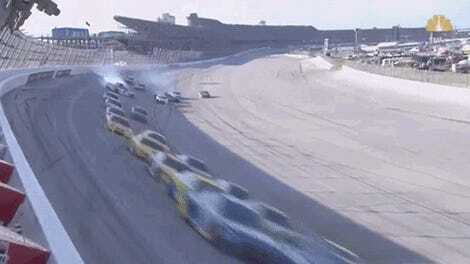 UPDATE [7:14 p.m.]: NBC Sports ultimately listed 17 cars as being involved in the crash. The numbers above have been updated.